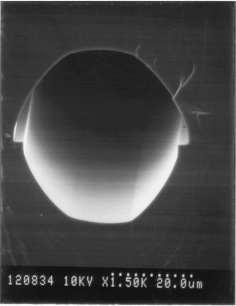 My Ph.D. research was done in the group Micromechanics, better known at the time as micmec, led by Prof. M.C. Elwenspoek. Supervisors were Dr. J.G.E. Gardeniers and Dr. A. van den Berg, who would become a professor later. Promotor was Prof. A. van den Berg, my supervisor. 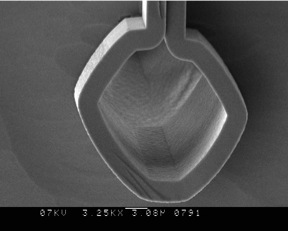 I researched the suitability of (electo)chemically etching silicon in fluoride containing solutions for the fabrication of microchannels. The research yielded a few interesting and unsuspected results, as shown below. The corresponding articles can be reached by clicking on the pictures. 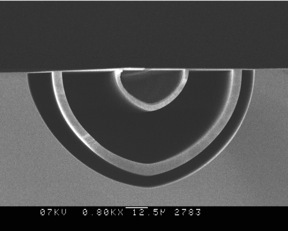 Microchannel made by bonding two isotropically etched wafers together. A so-called Multi-Walled microchannel, containing two free-standing layers of porous silicon. This work is patented, international patent nr. WO 99/45583 (1999). A buried microchannel, made by first etching a trench and afterwards etching the channel isotropically.